Jessica Hopper's music criticism has earned her a reputation as a firebrand, a keen observer and fearless critic not just of music but the culture around it. With this volume spanning from her punk fanzine roots to her landmark piece on R. Kelly's past, The First Collection leaves no doubt why The New York Times has called Hopper's work "influential." Not merely a selection of two decades of Hopper's most engaging, thoughtful, and humorous writing, this book documents the last 20 years of American music making and the shifting landscape of music consumption. The book journeys through the truths of Riot Grrrl's empowering insurgence, decamps to Gary, IN, on the eve of Michael Jackson's death, explodes the grunge-era mythologies of Nirvana and Courtney Love, and examines emo's rise. Through this vast range of album reviews, essays, columns, interviews, and oral histories, Hopper chronicles what it is to be truly obsessed with music. The pieces in The First Collection send us digging deep into our record collections, searching to re-hear what we loved and hated, makes us reconsider the art, trash, and politics Hopper illuminates, helping us to make sense of what matters to us most. 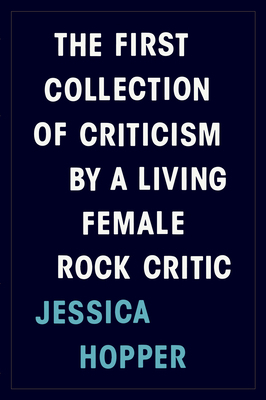 Jessica Hopper is a music and culture critic whose work regularly appears in GQ, Rolling Stone, The Village Voice, and the Chicago Tribune. She is a senior editor at The Pitchfork Review and the music editor at Rookie. Her essays have appeared in Best Music Writing for 2004, 2005, 2007, 2010, and 2011. Hopper was the longtime music consultant for This American Life. Her book, The Girls' Guide to Rocking was named one of 2009's Notable Books For Young Readers by the American Library Association. She lives in Chicago with her husband and young sons.